For over 100 years, the Voice of China and Asia has been touching Asia for Christ by proclaiming the Gospel, making disciples, and producing self-sustaining churches. Our focus has always been to touch the poor, the outcasts, and the refugees. The seeds of our work began when a 21 year-old young man, named Albert Reiton, pondered a simple question as he was washing bottles in an Astoria, Oregon brewery. He prayed, “Surely Lord, you have a greater plan than this for my life?” Immediately and miraculously, God’s plan began to unfold. Not long thereafter in 1909, in response to a great world-wide call for missionaries to China, Rev. Reiton and his new bride sailed for Hong Kong on a one-way ticket. The work they established there multiplied and continues to this day. As time passed the Reiton’s daughter, Helen, married Bob Hammond, the son of another missionary family. The Reitons and Hammonds worked together until their ministry was interrupted by the Japanese invasion of Hong Kong at the beginning of World War II. After an extended period of hiding, the families were imprisoned by the Japanese until they were repatriated in a POW exchange program. A book entitled “Bondservants,” was written about those early days that testified of their experiences and life of faith during their imprisonment. After returning to the United States, Bob and Helen started a radio program called “The Voice of China and Asia Radio Broadcast.” Daily, they told the story of their mission works in Asia, and ministered the Gospel. The program continued for 46 years and brought many to a saving knowledge of Jesus Christ. Many of these listeners and their children form the core of our partner base today. 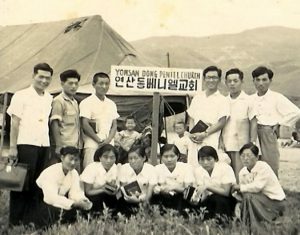 Our efforts in Korea which began as a traveling evangelistic and relief tent ministry, during the Korean War, has now grown into 125 churches, 4 high schools with 40,000 graduates, a 90-resident Home for severely handicapped orphans, an Alzheimer’s Home for 190 destitute elderly, and an online ministry to children which receives over a quarter million visits each week. To ensure the continuation of our work in Korea, the Peniel Seminary in Busan was started in 1990. Due to the interdenominational focus of our work over 1,100 students from 60 denominations have now graduated from our programs. They faithfully serve not only in Korea but in the Communist and Muslim nations throughout Asia. In recent years, the Voice of China and Asia has legally reentered China through a Bible ministry to the poorest of rural believers. Bibles are being legally printed in China and are available for purchase, but only in large metropolitan areas. There is no Bible distribution system for over half of China’s population who live in rural areas. Here upwards of 14,000 new believers per day are professing Jesus Christ as Savior. But, they don’t have access to Bibles. The Lord has allowed the Voice of China and Asia to fill this need by providing hundreds of thousands of Bibles each year for these forgotten believers. This is done through a three step process of purchasing, transporting, and personally verifying the delivery of Bibles to China’s rural believers. We have been told in some locations each Bible we distribute will become the main Bible for up to five people. These five will in turn lead three more people to a saving relationship with Jesus Christ. 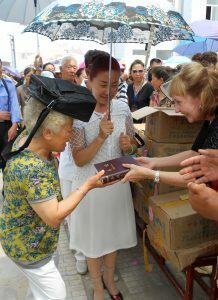 This has convinced us that Bible distribution in rural China is one of the most effective ways to evangelize the nation. Pastoral training is also one of our priorities. The average church in rural China has upwards of two hundred members, yet the majority of the pastors have had no Biblical or ministerial training. 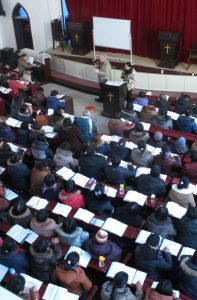 In answer to their prayers, the Voice of China and Asia is providing them with free Pastor’s Study Bibles. We also conduct two-day seminars to train them in their use. By empowering these pastors in their understanding of God’s Word, we are strengthening China’s church and our outreach to rural believers is being multiplied exponentially. In addition to all this, the Voice of China and Asia scholarships rural pastors with transportation, housing and meals to attend these training sessions. By equipping these leaders we affirm their ability to establish the truths of the Christian faith in their rural settings. With a century of ministry behind us, we look forward to the challenges and adventures in Christ that the Lord has ahead. As we advance we ask that you would pray for us, give through us, and go with us. Together we can strategically touch Asia for Christ and ensure the Gospel is established in yet another generation for God’s glory. Millions of Chinese are fasting and praying for Bibles. Let’s become the living answer to their prayers! Click this link, Financial Accountability.